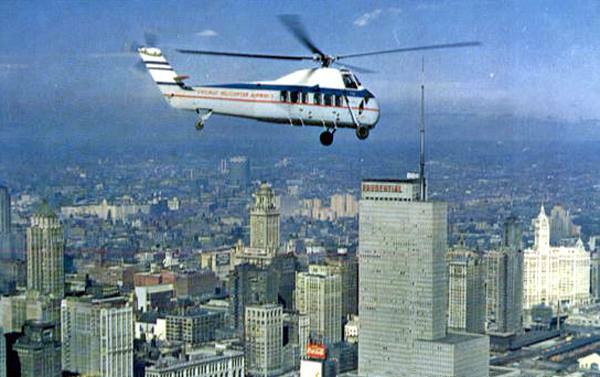 May 18, 1967 – Officials of Chicago Helicopter Airways, Inc. predict that the helicopter line may be hauling a million passengers annually within a few years. The chairman of the company, John S. Gleason, Jr., says that preliminary plans have begun for developing a downtown heliport in Grant Park or on adjacent Illinois Central air rights. Gleason is encouraged by reports that a projection of 300 flights a day operating out of a revamped Midway Airport could result in the shuttling of a million passengers a year between Midway, O’Hare and the Loop. He is also optimistic about a third major airport being built in the lake. Optimism is the engine that turns the rotors, right? Even if the craft never gets off the ground, the noise sure gets your attention.